After all your waiting and planning you are finally a Mr and Mrs and a new life as a married couple begins with you sharing the responsibilities of running your home, paying the bills and making all the important decisions together and although it can be considered a minor task that needs to be done. However, the writing and sending of 'Thank You' cards and letters to your wedding guests should be done within two months of your wedding date or even sooner! Some family members, close friends or those that are unable to make your special day may even send you a gift before the wedding and the ideal time to send them a Thank You card or letter should be as soon as you have receive the gift. Wedding guests will have given their time and effort as well as spent their money on choosing a gift for your new home and some may have even donated to a charity as you requested or given that little bit extra towards the cost of your honeymoon. Whatever was given it is only polite and considerate to let them know how thankful you both are and a simple phone call, email, or a 'thank you' in passing is not quite the same as a note or letter expressing your pleasure. Thank You notes can come in many sizes, shapes, colours and/or themes and you can make them as plain or as ornate as you wish. They can be hand made by you both which will definitely give them that more personalised touch, purchased online or designed and ordered from a stationery store. When choosing which words to put on your Thank You note or letter, the details of the gift along with their names should, as etiquette states, always be mentioned so the receiver feels it is more personal rather than a generic one sent out to all your wedding guests. At one time etiquette ruled that the wording on Thank You cards and letters should be very formal and hand written and once upon a time wedding guests were invited from near and far and most Bride's and Groom's had never met nor would ever meet some of them again! The majority of weddings today are planned thoroughly and with restrictions on budget costs and space the wedding guests are chosen with great care and the vast majority of couples only really want special family and friends to share in their celebration. 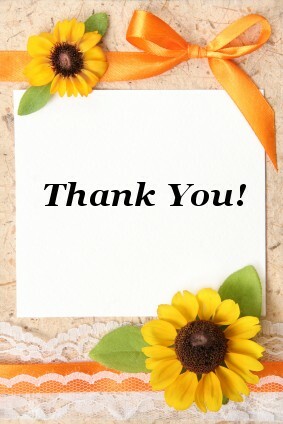 It is because of this reason the wording on Thank You notes and letters have become less formal and more personal to the Bride and Groom as well as the sender of the gift; and the busy lives we lead have led to a lot of newlyweds buying ready-made cards, making them themselves or having a professional take the strain away from them. Many variations and examples on wordings of how to write a Thank You card and letter can be found on the internet or in library books if you are really stuck on what to say. Whatever method a couple choose to use when sending out their Thank You cards and letters is not really that important, nor is the wording; it is the fact that they have taken the time and effort to show their appreciation for a gift they were given!